A few of Noah’s articles are displayed below. Scroll down for a complete list by date. Birds of the Photo Ark (with Joel Sartore). National Geographic. 2018. Birding Without Borders: An Obsession, A Quest, and the Biggest Year in the World. Houghton Mifflin Harcourt. 2017. The Thing With Feathers: The Surprising Lives of Birds and What They Reveal About Being Human. Riverhead Books. 2014. Among Penguins: A Bird Man in Antarctica. Oregon State University Press. 2011. Strycker. N. 2019. Birding the very deep south. Birder’s Guide to Travel. Jan: 20-31. Strycker, N. 2018. After the Big Year: The 2017 International Hornbill Expedition: Searching for a rare bird in remote Malaysia. Birding. Aug: 52-57. Strycker, N. 2018. Why it matters: Birdlife. 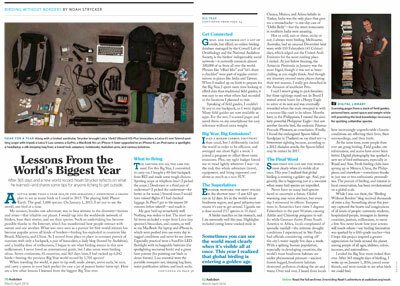 National Geographic Traveler. Aug/Sep. Strycker, N. 2018. The world’s best destinations for bird-watching. National Geographic Travel. Mar 8. Strycker, N. 2017. Birding the world: Everything old is new again. In L. White and J. A. Gordon (eds. ), Good birders still don’t wear white. Houghton Mifflin Harcourt: Boston. Strycker, N. 2017. 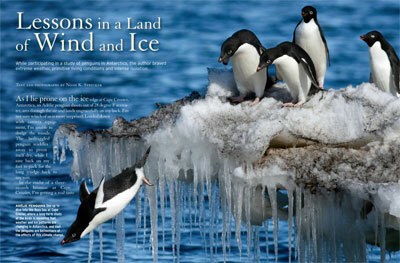 Book review: One wild bird at a time: Portraits of individual lives by Bernd Heinrich. The Quarterly Review of Biology, 92(4): 487. Strycker, N. 2017. Birding without borders: Putting another perspective on the joys of finding everyday birds. The Early Birder Blog. Nov 15. Strycker, N. 2017. Take a look at this extremely rare white penguin. Audubon. Mar 8. Strycker, N. 2016. House Finch or Purple Finch? Here’s how to tell them apart. Audubon. Dec 28. Strycker, N. 2016. Summer’s not over yet, and neither is shorebird season. Audubon. Sep 2. Strycker, N. 2016. 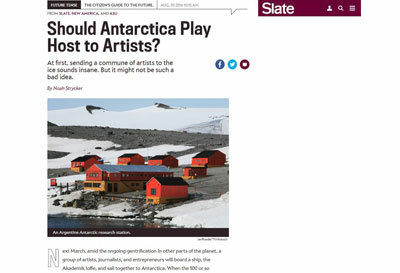 Should Antarctica play host to artists? Slate. Aug 30. Strycker, N. 2016. Two guys just broke the North American big year record–but how? Audubon. Jul 26. Strycker, N. 2016. My top Big Year birds. BirdWatching. Jun: 16-21. Strycker, N. 2016. Conservation milestones. Birder’s Guide. May: 8-12. Strycker, N. 2016. The birds are back at Malheur National Wildlife Refuge. Audubon. Apr 14. Strycker, N. 2016. The world big year. Birding. Apr: 34-45. Strycker, N. 2016. Lessons learned from the world’s biggest year. Audubon. Mar/Apr: 25 and 27. Strycker, N. 2015. Why birdwatchers flock to Ecuador. 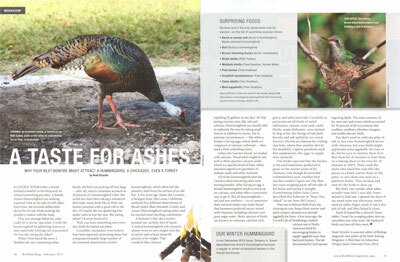 Smithsonian Journeys Quarterly. Sep 2. Strycker, N. 2015. Conservation milestones. Birder’s Guide. May: 6-8. Strycker, N. 2015. Birding without borders. Audubon. Jan/Feb. Strycker, N. 2014. Bipolar disorder. Audubon. Sep/Oct: 80-86. Strycker, N. 2014. 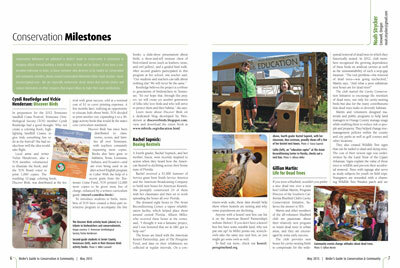 Conservation milestones. Birder’s Guide. May: 12-20. Strycker, N. 2013. A taste for ashes. Birdwatching. Feb: 26-27. Strycker, N. 2012. Take this photo. WildBird. Sep/Oct: 22-23. Strycker, N. 2012. 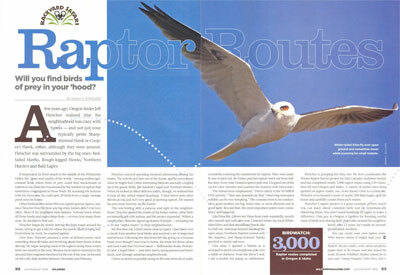 Raptor routes. WildBird. Jul/Aug: 22-23. Strycker, N. 2012. Hummer numbers. WildBird. May/Jun: 24-25. Strycker, N. 2011. The 2,650-mile summer. The Register-Guard. Oct. 4: D1-D2. Strycker, N. 2011. 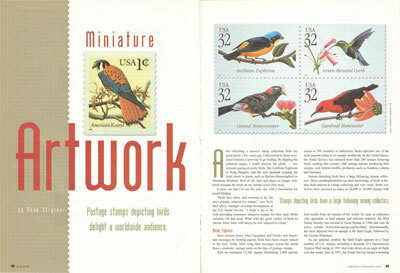 Internet birding: You’ve got bird mail. Birder’s World. Jan/Feb: 32-35. Strycker, N. 2010. Lists of wonder. Popular Birding Series: Advanced Backyard Birding (Vol. 3). 88-93. Strycker, N. 2010. Can I see some ID? Popular Birding Series: Hummingbirds (Vol. 2). 26-34. Strycker, N. 2010. Lessons in a land of wind and ice. National Wildlife. Feb/Mar: 22-29. Strycker, N. 2009. 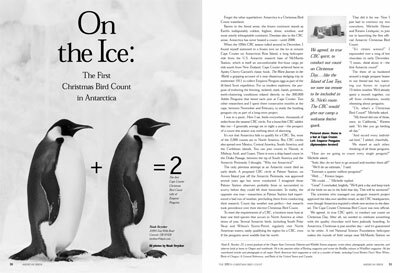 On the ice: The first Christmas Bird Count in Antarctica. American Birds. Dec: 30-34. Strycker, N. 2009. Get to know your feathered friends with a backyard bird checklist. Popular Birding Series: Backyard Birding (Vol. 1). Strycker, N. 2008. Keeping tabs. Backyard Birding, Vol. 1. 114-119. Strycker, N. 2008. Endemics, islands, and ecotourism. Birding. Jul/Aug:42-52. Strycker, N. 2007. Be an iBirder. In L. White (ed. ), Good birders don’t wear white. Houghton-Mifflin: Boston. Strycker, N. 2006. Holiday gatherings for the birds. Oregon Coast. Dec: 36-37. Strycker, N. K., and W. D. Robinson. 2006. 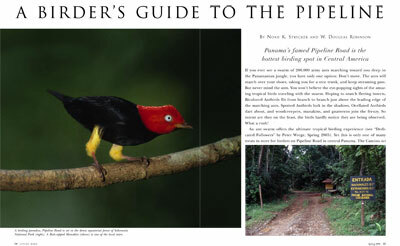 A birder’s guide to the pipeline. Living Bird. Spring: 14-21. Strycker, N. 2006. Picture perfect. Birds and Blooms. Dec/Jan: 38-40. Strycker, N. 2005. iLike my iPod! Birding. Nov/Dec: 666-668. Strycker, N. 2005. Birding in burns. Bird Watcher’s Digest. Jul/Aug: 32-35. Strycker, N. 2005. Rich in written detail: Historical field notes about southeastern Oregon bring the past to life. WildBird. Jul/Aug: 52-55. Strycker, N. 2005. Secrets of a Big Day addict. Birder’s World. Jun: 34-39. Strycker, N. 2004. A backyard checklist. Bird Watcher’s Digest. Jul/Aug: 98-99. Strycker, N. 2004. 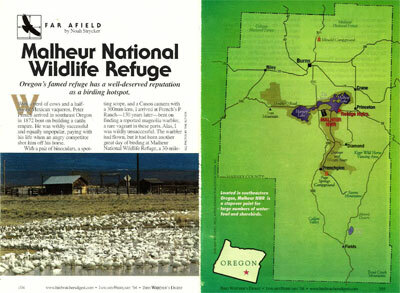 Far afield: Malheur National Wildlife Refuge. Bird Watcher’s Digest. Jan/Feb: 104-113. Strycker, N. 2004. Turkey Vulture nesting on Spencer Butte, Lane County. Oregon Birds. 30(1): 10-11. Strycker, N. 2003. 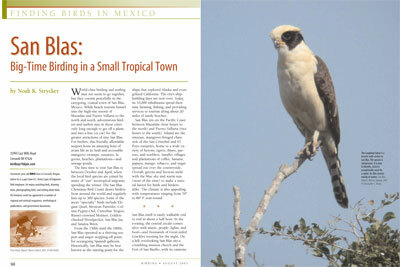 San Blas, Mexico: Big-time birding in a small tropical town. Birding. Aug: 368-374. Strycker, N. 2003. Five best places to find birds. Oregon Coast. Jul/Aug: 64-65. Strycker, N. 2003. Gearing up for the ABA convention: Birdfinding in Eugene, Oregon. Birding. Apr: 146-154. Strycker, N. 2003. Brown Creepers nest in a manufactured “creeper house.” Oregon Birds. 29(1): 17. Strycker, N. 2003. Miniature artwork. WildBird. Jan/Feb: 48-51. Strycker, N. 2003. Backyard birder. Oregon Coast. Jan/Feb: 30-31. Strycker, N. 2002. Issues with birds. Birder’s World. Aug: 44-45. Strycker, N., et al. 2010. Use of Himalayan blackberry patches by wintering birds in western Oregon. Oregon Birds. 35: 55-60. Strycker, N. 2009. Bird species accounts (300+) for birdfellow.com.Strycker, N. 2009. Owl accounts for Birds of the United States and Canada. DK Publishing: New York. Strycker, N., W.D. Robinson, and T.R. Robinson. (November 9, 2005). Comparative egg sizes of north temperate and neotropical birds. Poster presented at the 3rd annual Research Advances in Fisheries, Wildlife, and Ecology (RAFWE) Symposium, Oregon State University. Strycker, N. 2003. Black-capped Chickadee. In D. Marshall, M. Hunter, & A. Contreras (eds. ): Birds of Oregon: A general reference. Oregon State University Press, 438-440. Strycker, N. 2003. Mountain Chickadee. In D. Marshall, M. Hunter, & A. Contreras (eds. ): Birds of Oregon: A general reference. Oregon State University Press, 440-441. Strycker, N. 2003. Green Heron. In D. Marshall, M. Hunter, & A. Contreras (eds. ): Birds of Oregon: A general reference. Oregon State University Press, 68-69. Strycker, N. 2003. Cedar Waxwing. In D. Marshall, M. Hunter, & A. Contreras (eds. ): Birds of Oregon: A general reference. Oregon State University Press, 501-502. Strycker, N. 2003. Early twentieth century ornithology in Malheur County, Oregon. Oregon Field Ornithologists Spec. Pub. No. 18.Shelton, Albert C. 2002 (reprint; original publication date 1917). A distributional list of the land birds of west central Oregon. Strycker, N. (ed.). Oregon Field Ornithologists Spec. Pub. No. 14. Strycker, N. 2019. A Birding Interview with John Marzluff. Apr: 24-28. Strycker, N. 2019. A Birding interview with Richard Crossley. Feb: 34-37. Strycker, N. 2018. A Birding interview with James A. Tucker. Dec: 12-17. Strycker, N. 2018. A Birding Interview with Dan Cooper. Oct: 22-26. Strycker, N. 2018. A Birding Interview with Catherine Hamilton. Aug: 18-22. Strycker, N. 2018. A Birding Interview with Jerry Liguori. Jun: 18-22. Strycker, N. 2018. A Birding Interview with Rafael Galvez. Apr: 28-33. Strycker, N. 2018. A Birding Interview with Bernd Heinrich. Feb: 28-31. Strycker, N. 2017. A Birding Interview with John Kricher. Dec: 16-20. Strycker, N. 2017. A Birding Interview with Lili Taylor. Oct: 16-20. Strycker, N. 2017. A Birding Interview with Richard (“Rick”) Prum. Aug: 18-23. Strycker, N. 2017. A Birding Interview with Bill Thompson III. Jun: 24-28. Strycker, N. 2017. A Birding Interview with Bridget J. Stutchbury. Apr: 24-28. Strycker, N. 2017. A Birding Interview with Jim Tietz. Feb: 20-24. Strycker, N. 2016. A Birding Interview with Alison Sheehey. Dec: 20-24. Strycker, N. 2016. A Birding Interview with Roz Chast. Oct: 20-23. Strycker, N. 2016. A Birding Interview with Shyloh van Delft. Aug: 16-19. Strycker, N. 2016. A Birding Interview with Amar Ayyash. Jun: 18-24. Strycker, N. 2016. A Birding Interview with Jonathan Rosen. Apr: 18-22. Strycker, N. 2016. A Birding Interview with James D. Rising. Feb: 14-19. Strycker, N. 2015. A Birding Interview with Marky Mutchler and Dessi Sieburth. Dec: 14-19. Strycker, N. 2015. A Birding Interview with Frank Gill. Oct: 16-20. Strycker, N. 2015. A Birding Interview with Macklin Smith. Aug: 16-19. Strycker, N. 2015. A Birding Interview with Jennie Duberstein. Jun: 16-19. Strycker, N. 2015. A Birding Interview with Paul Hess. Apr: 16-21. Strycker, N. 2015. 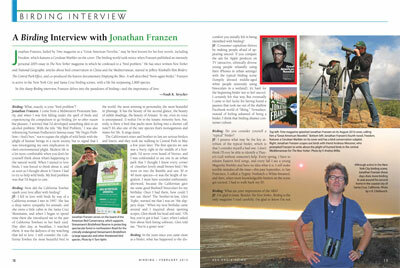 A Birding Interview with Jonathan Franzen. Feb: 18-22. Strycker, N. 2014. 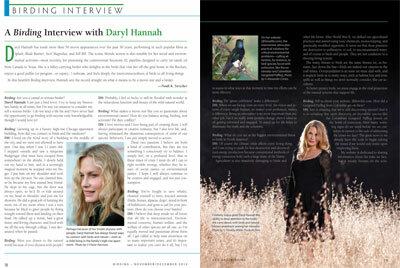 A Birding Interview with Daryl Hannah. Nov: 18-20. Strycker, N. 2014. A Birding Interview with Michael O’Brien. Sep: 14-18. Strycker, N. 2014. A Birding Interview with Scott Weidensaul. Jul: 14-17. Strycker, N. 2014. A Birding Interview with David Ainley. May: 12-15. Strycker, N. 2014. A Birding Interview with Shelly Plante. Mar: 18-22. Strycker, N. 2014. A Birding Interview with John Sill. Jan: 20-24. Strycker, N. 2013. A Birding Interview with Ioana Seritan and Eric Hughes. Nov: 16-19. Strycker, N. 2013. A Birding Interview with Sean Dooley. Sep: 16-19. Strycker, N. 2013. A Birding Interview with Robert C. Leberman and Robert S. Mulvihill. Jul: 16-21. Strycker, N. 2013. A Birding Interview with Rick Wright. May: 18-21. Strycker, N. 2013. A Birding Interview with Victor Emanuel. Mar: 18-21. Strycker, N. 2013. A Birding Interview with Wayne R. Petersen. Jan: 20-25. Strycker, N. 2012. A Birding Interview with Andrew Farnsworth. Nov: 18-21. Strycker, N. 2012. A Birding Interview with Chandler S. Robbins. Sep: 16-23. Strycker, N. 2012. A Birding Interview with Steve N. G. Howell. Jul: 16-19. Strycker, N. 2012. A Birding Interview with Ellie Cohen. May: 16-19. Strycker, N. 2012. A Birding Interview with Tony White. Mar: 14-17. Strycker, N. 2012. A Birding Interview with Paul Lehman. Jan: 14-16. Strycker, N. 2011. A Birding Interview with Laura Erickson. Nov: 14-16. Strycker, N. 2011. A Birding Interview with Brian L. Sullivan. Sep: 14-17. Strycker, N. 2011. A Birding Interview with Sophie Webb. Jul: 16-18. Strycker, N. 2011. A Birding Interview with Kimball Garrett. May: 16-19. Strycker, N. 2011. A Birding Interview with Hugo Enriquez. Mar: 16-18. Strycker, N. 2011. A Birding Interview with J. Michael Scott. Jan: 18-20. Strycker, N. 2010. A Birding Interview with Dominic Mitchell. Nov: 18-20. Strycker, N. 2010. A Birding Interview with Geoffrey Hill. Sep: 20-22. Strycker, N. 2010. A Birding Interview with George Fenwick. Jul: 20-22. Strycker, N. 2010. A Birding Interview with Terry Moore. May: 20-22. Strycker, N. 2010. A Birding Interview with Julie Zickefoose. Mar: 16-18. Strycker, N. 2010. 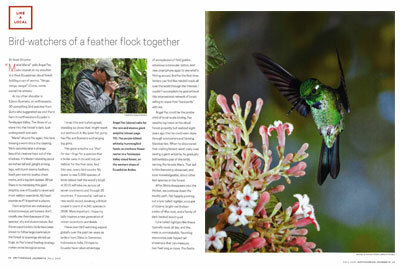 A Birding Interview with Alvaro Jaramillo. Jan: 18-20. Strycker, N. 2009. A Birding Interview with Bill Pranty. Nov: 18-20. Strycker, N. 2009. A Birding Interview with Stephen Kress. Sep: 16-18. Strycker, N. 2009. A Birding Interview with Jessie Barry. Jul: 18-20. Strycker, N. 2009. A Birding Interview with Donald Kroodsma. May: 18-20. Strycker, N. 2009. A Birding Interview with Richard C. Banks. Mar: 18-20. Strycker, N. 2009. A Birding Interview with Will Russell. Jan: 18-20. Strycker, N. 2008. A Birding Interview with Peter Pyle. Nov: 16-18. Strycker, N. 2008. A Birding Interview with Donna Dittmann. Sep: 22-24. Strycker, N. 2008. A Birding Interview with Jon L. Dunn. Jul: 18-20. Strycker, N. 2008. A Birding Interview with Lisa White. May: 18-20. Strycker, N. 2008. A Birding Interview with Pete Dunne. Mar: 20-22. Strycker, N. 2008. A Birding Interview with John Fitzpatrick. Jan: 18-20. Strycker, N. 2007. A Birding Interview with David Wilcove. Nov: 20-22. Strycker, N. 2007. A Birding Interview with Dudley Edmondson. Sep: 22-23. Strycker, N. 2007. A Birding Interview with Amy Hooper. Jul: 18-20. Strycker, N. 2007. A Birding Interview with David A. Sibley. May: 18-21. Strycker, N. 2007. A Birding Interview with Paul Ehrlich. Mar: 18-20. Strycker, N. 2007. A Birding Interview with Kenn Kaufman. Jan: 18-20. Strycker, N. 2010. Forever Young. WildBird. Nov/Dec: 12-13. Strycker, N. 2010. Fairywrens of Oz. WildBird. Sep/Oct: 12-13. Strycker, N. 2010. I’m with the banders. WildBird. Jul/Aug: 12-13. Strycker, N. 2010. Motorless Hummer. WildBird. May/Jun: 22-23. Strycker, N. 2010. Best week ever. WildBird. Mar/Apr: 22-23. Strycker, N. 2010. The 50-mile bird walk. WildBird. Jan/Feb: 22-23. Strycker, N. 2009. Vegas, baby! WildBird. Nov/Dec: 23. Strycker, N. 2009. The crutch list. WildBird. Sep/Oct: 22-23. Strycker, N. 2009. The bird club. WildBird. Jul/Aug: 22-23. Strycker, N. 2009. Unhappy feet. WildBird. May/Jun: 22-23. Strycker, N. 2009. Mister lister. WildBird. Mar/Apr: 22-23. Strycker, N. 2009. Hawaiian bird chef. WildBird. Jan/Feb: 22-23. Strycker, N. 2008. To sea the birds. WildBird. Nov/Dec: 26-27. Strycker, N. 2008. In the dark. WildBird. Sep/Oct: 22-23. Strycker, N. 2008. Printing penguins. WildBird. Jul/Aug: 22-23. Strycker, N. 2008. Peak experience. WildBird. May/Jun: 22-23. Strycker, N. 2008. Taxidermy with class. WildBird. Mar/Apr: 22-23. Strycker, N. 2008. Down under. WildBird. Jan/Feb: 22-23. Strycker, N. 2007. No place like home. WildBird. Nov/Dec: 22-23. Strycker, N. 2007. iPod therefore iBird. WildBird. Sep/Oct: 22-23. Strycker, N. 2007. Island boy. WildBird. Jul/Aug: 22-23. Strycker, N. 2007. Southern discomfort. WildBird. May/Jun: 22-23. Strycker, N. 2007. A bird in the hand. WildBird. Mar/Apr: 22-23. Strycker, N. 2007. Puffin stuff. WildBird. Jan/Feb: 22-23. Strycker, N. 2006. A young bird artist. WildBird. Nov/Dec: 22-23. Strycker, N. 2006. The Cornflake King and I. WildBird. Sept/Oct: 22-23. Strycker, N. 2006. Backpacking with the birds. WildBird. Jul/Aug: 14-15. Strycker, N. 2006. Big day. WildBird. May/Jun: 14-15. Strycker, N. 2006. In search of nests. WildBird. Mar/Apr: 10-11. Strycker, N. 2006. The heart of darkness. WildBird. Jan/Feb: 10-11. Strycker, N. 2005. Avian art. WildBird. Nov/Dec: 10-11. Strycker, N. 2005. Will work for life birds. WildBird. Sep/Oct: 10-11. Strycker, N. 2005. The gap year. WildBird. Jul/Aug: 10-11. Strycker, N. 2005. Home on the refuge. WildBird. May/Jun: 10-11. Strycker, N. 2005. Blind date. WildBird. Mar/Apr: 10. Strycker, N. 2005. I never met a vulture I didn’t like. WildBird. Jan/Feb: 11. Strycker, N. 2017. Send Us Your Conservation Milestones! 14 Feb.
Strycker, N. 2015. The Ultimate Big Year. 1 Jan.
Strycker, N. 2014. The Festival Phenomenon. 18 Nov.
Strycker, N. 2014. Cell Phone Bird Photography. 14 Aug.
Strycker, N. 2014. A Visit to the Book Shop. 12 Jun. Strycker, N. 2014. 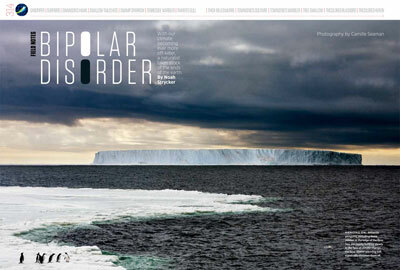 Antarctica, New Media, and Old-Fashioned Birding. 13 Mar. Strycker, N. 2013. Bright Night Lights. 12 Nov.
Strycker, N. 2013. Breaking the Ice Across the Pond. 17 Sep.
Strycker, N. 2013. Peru’s Insane Birding Rally Challenge. 25 Jun. Strycker, N. 2013. The 48-hour Birdathon. 5 Jun. Strycker, N. 2013. A Different Kind of Wildlife Photography. 7 Apr. Strycker, N. 2013. Loneliness of the Antarctic birder. 30 Jan.
Strycker, N. 2012. Birding by webcam. 24 Oct.
Strycker, N. 2012. Birding after LASIK. 2 Sep.
Strycker, N. 2012. Adventures in county listing. 4 Jul. Strycker, N. 2012. Back to middle school. 1 May. Strycker, N. 2012. Shoo fly, don’t bot me. 14 Mar. Strycker, N. 2012. A Christmas count story. 4 Jan.
Strycker, N. 2011. 63 saw-whets in one night. 2 Nov.
Strycker, N. 2011. Finishing the 2,665-mile bird walk. 29 Sep.
Strycker, N. 2011. The 2,665-mile bird walk. 4 May. Strycker, N. 2011. A note from Cano Palma, Costa Rica. 5 Mar. Strycker, N. 2010. Yard listing on the Farallones. 16 Nov.